Through this relentlessly cold and snowy (and recently icy) winter season, I have been diligently trying to empty my chest freezer of several seasons' worth of chopped, pureed and oven-roasted garden tomatoes. I have been so diligent that I have in fact, run out of my homegrown tomato "gold", so I was delighted when Mooney Farms sent me a sampler box of some of their Bella Sun Luci sun-dried tomato products. Mooney Farms is a family-owned company located in California, and has a wide variety of plain and seasoned sun-dried tomatoes packed in olive oil and resealable pouches of julienne-cut sun-dried tomatoes. Dan and I popped the lid off the Sun-Dried Tomato Pesto with Pine Nuts the same night we received our package and mixed it over our warm pasta. The sauce is nicely acidic and we made sure to mop up all sauciness with the heel of our accompanying bread. Delicioso! We also broke into a jar of Bruschetta and added a dollop to our omelets one morning. Very tasty once again. Combine cider and sugar until dissolved, add mayonnaise and stir until smooth. You can check out a slew of other recipes using Bella Sun Luci's line of sun dried tomato products back at the Mooney Farms website, or create your own and enter to win a $2,500 cash prize in the company's recipe contest by July 1st. 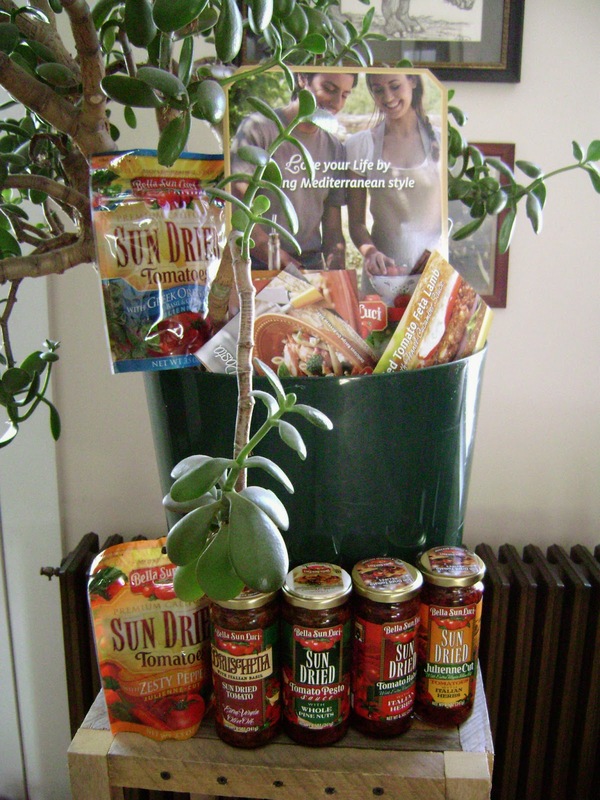 Mooney Farms has generously offered to provide a giveaway of some of their Bella Sun Luci sun dried tomato items to a Crispy Cook reader. To enter the giveaway, you must leave a comment below by the deadline of April 2, 2014. You can also earn an additional entry by liking the Crispy Cook on Facebook. If you have already liked the Crispy Cook, just note that in your comment below and your comment will count twice toward the random drawing for this giveaway. Giveaway limited to U.S. shipping addresses only. 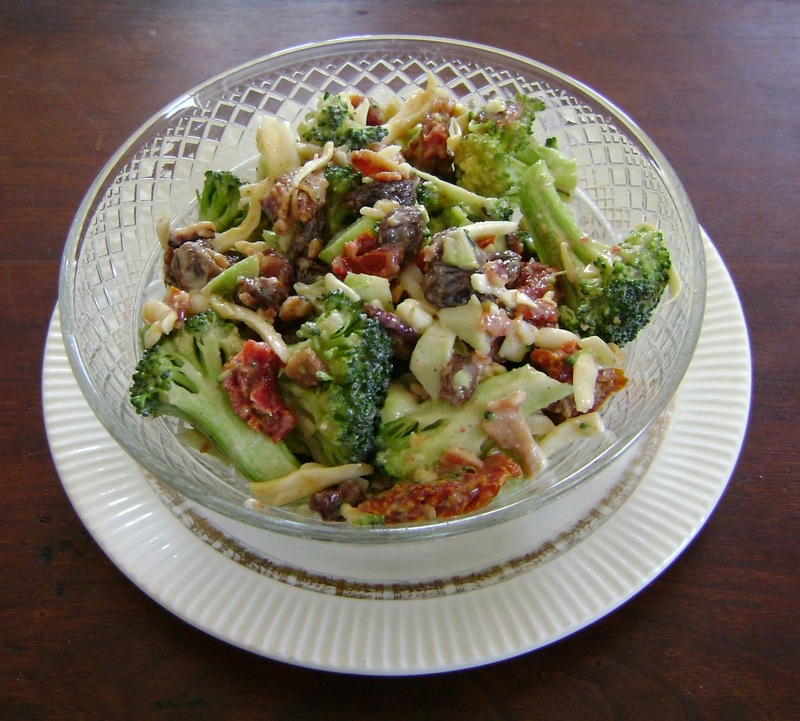 I am sending a virtual bowl of this toothsome Sun Dried Tomato Studded Broccoli Salad to Deb at Kahakai Kitchen for her Souper Sundays event, where each week a sampling of soups, salads and sandwiches are rounded up from great home cooks around the world. **Note: I received a box filled with 5 jars of Bella Sun Luci Sun Dried Tomatoes and 2 bags of julienne-cut Bella Sun Luci Sun Dried Tomatoes from Mooney Farms, but I was not compensated for this post or obligated to post a review. As always, my comments are completely my own. I always like to have some sun-dried tomatoes on my pantry shelf. Thanks for sharing the recipe. The recipe is a wonderful way to use the products I'd love to try it. The salad looks fabulous--slightly decadent and so much flavor. Thanks for sharing it with Souper Sundays--I'll add it to tomorrow's roundup. Happy Weekend! So lucky to get that care package! I love the sounds of that broccoli salad. It is time to start eating fresh! I love sundried tomatoes and am always sneaking them into recipes- funny thing is, I'm not a huge fan of regular tomatoes!